I sometimes wonder what the CEOs of fossil fuel companies think about the effect of their products on the atmosphere and whether they harbour any anxieties about climate change. 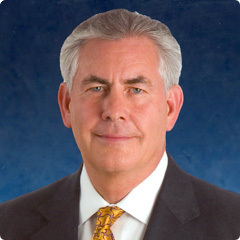 One of them, Rex Tillerson of ExxonMobil, has told us how he views the matter in his reply to a question following a speech he gave to the Council of Foreign Relations last week, a speech in which he had explained how unexpectedly vast the sources of extractable natural gas and oil in North American rocks are proving to be. To get a full sense of his reply to the question you’ll need to look at it on the website – it’s about two thirds the way down the page. It’s copyrighted but I’ll try to give a fair paraphrase of his main points albeit accompanied by my criticisms. Tillerson is answering a question, not delivering a prepared statement, but his answer no doubt broadly reveals his basic stance on the question. Tillerson’s reply is a not unfamiliar mix. To begin with he did not deny the science, and indeed claimed close familiarity with the work of the IPCC, even engagement with it. But because ExxonMobil understands the science it knows that the modelling of the future impacts of warming is “not particularly good”. We can’t model aerosols and we can’t model clouds which play a big part in how the carbon dioxide concentrations affect temperatures. We need better models, and Tillerson claimed ExxonMobil is putting a lot of money into supporting people working on the models. But in any case our ability to predict with any accuracy what the future will be like is pretty limited, he asserts. So he’s not disputing there will be an impact, just saying that we can’t be sure how large or how dire the consequences. However he considers that a reasonable scientific approach finds they will be manageable, albeit requiring an increased effort in preparing for adaptation. He focuses on the need, for example, to plan to adapt to a possible four to six inches rise in sea level. If you wonder where he found such a relatively comfortable prediction, it follows his observation that predictions for sea level rise are “all over the map”, which presumably justifies his going for the lowest available. So far his reply to the question is evasion of the science he claims to understand and accept. His dismissal of the reliability of modelling is overstated and clearly slanted to downplay the dangers of warming. He makes no mention of impacts already being observed, or of the lessons of paleoclimate studies. His conclusion that the impacts will be manageable is far from what the science points to. …concentrations of carbon dioxide in the atmosphere eventually would reach levels higher than in the Pliocene era, more than 2.5 million years ago, when sea level was at least 50 feet higher than it is now. That level of heat-trapping gases would assure that the disintegration of the ice sheets would accelerate out of control. Sea levels would rise and destroy coastal cities. Global temperatures would become intolerable. Twenty to 50 percent of the planet’s species would be driven to extinction. Civilization would be at risk. If this sounds apocalyptic, it is. If Tillerson’s “reasonable scientific approach” suggests the impacts of climate change are readily manageable he’s obviously denying scientific reality at the same time as invoking it. Hansen is not an outlier among climate scientists. Tillerson gets worse as he proceeds to praise the adaptive ability of the human species. Adapt is what we’ve always done and it’s how we will manage climate change. We can cope with changing weather patterns that mean growing crops in different places. “It’s an engineering problem and it has engineering solutions.” We can’t stop burning fossil fuels out of fear of what it might mean for the future. Where does his confidence come from? It strikes me as conjured up from nowhere to justify pursuing a course heavy with danger for the human future. It’s really recklessness dressed up as confidence. The meeting’s chair wasn’t prepared to let Tillerson’s reply to the question rest there. He referred to the speaker at his daughter’s recent graduation saying that global warming was the great challenge of the generation. He asked whether Tillerson agreed that it was at least one of the top five challenges of the generation or whether he thinks it’s been way overblown. Well, it is a great challenge, replied Tillerson, but he reiterated that it’s a solvable one through the engineering solutions to any adaptation needs. There are much more pressing priorities for humanity. Billions of people in poverty need affordable electricity. Burning fossil fuels would greatly improve the quality of their life, their health, their children’s health, and their future prospects. And we can do it in more efficient ways, with lower energy intensity. He makes it clear from the start that combating climate change is inextricably linked with poverty reduction as the two greatest challenges of the century and that we shall succeed or fail on them together – to tackle only one is to undermine the other. This theme is frequently sounded in the book, and is an indication of the humanity which he brings to his task, as well as the realism. No doubt Tillerson is only articulating a view of climate change shared by a great number of people in business and in government. One can easily imagine them reassuring one another that there’s no need to go overboard on this climate change business. Perhaps there’s something to it, but it will be nowhere near as bad as alarmist scientists like to paint it. There’s certainly no question of our being required to stop making good money from fossil fuels while we can still find them. But no matter how mutually reinforcing are the communities which deny or downplay the impacts of climate change, no matter how urbane the expression of their complacency, their position is intellectually obtuse and morally indefensible. And it stands squarely in the way of the urgently needed changes we need to make in sourcing our energy supplies.